Hilarity and unpredictable outcomes await with USAopoly's Telestrations Game! The award winning, laugh-out-loud party game has players simultaneously draw what they see then guess what they saw to reveal the craziest results. In other words, it's the telephone game sketched out! In this fun, modern twist on the classic telephone game, there are multiple words being passed around between players, with everyone sketchin' and guessin' at the same time! But the real fun and laughter is the big reveal, where players get their own books back and get to share how "this" became "that!" 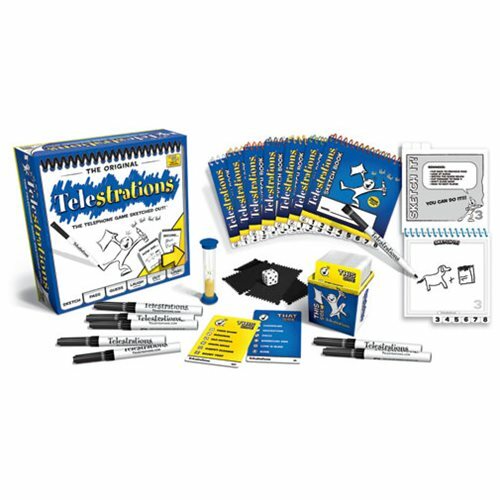 The Telestrations Game includes 8 erasable color coiled sketch books, 8 dry-erase markers, 8 clean-up cloths, 142 "This Side" & "That Side" cards in a card box (featuring 1,700+ words/phrases/categories), 1 die, a 60-second sand timer, and full color instructions. For 4 to 8 players. Ages 8 and up.